In writer/director D.J. 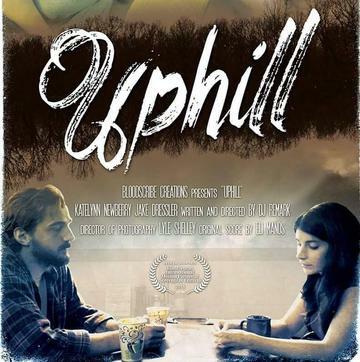 Remark's involving 18-minute short film Uphill, Amanda (KateLynn E. Newberry) suddenly invites ex-boyfriend William (Jake Dressler) to get together a full two years after their not so amicable break-up. It's the kind of "get together" we all dread, an awkward combination of rehashing the past, remembering the promises and somehow getting the strength to move on and let go. Uphill at first seems to be all about William, an apparently good guy who took a downward spiral that not only impacted him but his relationship with Amanda as well. However, by the time the story has been told it's abundantly clear that this is really Amanda's story and it's a poignant one brought vividly to life by KateLynn E. Newberry's intuitive, sensitive performance opposite the wide emotional chasm presented by Jake Dressler's not quite "recovered" William. The story in Uphill is simple, straightforward and relatively familiar yet familiar in that comfortable way that makes you appreciate watching it. Eli Manos's original music serves as a fine, low-key accompaniment to Remark's vision for the film and to the quietly authentic performances offered by both Newberry and Dressler. Lyle Shelley's lensing is largely effective here and matches up nicely to Remark's more ambitious than usual approach to telling a story that occasionally flashes back and forth as we both understand the past while slowly embracing the current reality of a promising relationship where the spark has slowly dissipated. Uphill is currently getting set for its indie fest run and should have no problem finding fans among those who have an appreciation for low-budget indie shorts. For more information on the film, visit the Uphill Facebook page linked to in the credits.